Station Hollywood: Happy birthday to Rajesh Roshan. Happy birthday to Rajesh Roshan. The viewers of bollywood films wish happy birthday to Rajesh Roshan on 24th May, 2014. 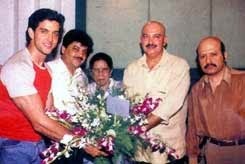 Being the son of Roshan Lal Nagrath, Rajesh Roshan had a great task of matching the great performance of his father as a composer. He was born in 1955. Although his compositions did not have the classical touch, he composed catchy tunes which attracted the attention for the viewers. He received the filmfare award for the best composer for his brilliant composition in the film Julie in the mid-70s. He composed excellent music in Rishi Kapoor’s film Aap Ke Diwane. Rishi Kapoor, Rakesh Roshan and Tina Munnim were the lead performers in the film. All the songs sung by Mohammad Rafi and Kishore Kumar were super hit including the songs “tumko kush dekhkar”, “aap ke diwane hai”, etc. He gave good music in Big B’s film Yaarana. Kishore Kumar’s song “chukar meri manko” became big hit. From the 1990s, he concentrated more on composing music in his brother’s films, that is Rakesh Roshan’s film. All the songs of the film Karan Arjun became super hit including “suraj ki peheli kiran se”, “bhangra bole”, etc. The film also became super hit. The music that he composed in Hrithik Roshan’s films became landmark hits. All the songs of Kahona Pyar Hai, were super hit including “pyar ki kashti me”, “haseeno ki mehfil”, etc. All the songs of the film Koi Mil Gaya became super hit including the title song “koi mil gaya”. All the songs of the film Krissh became super hit including “dil na liya”, “chori chori chupke chupke”, etc. He also won the filmfare award for the best music director for the composition of music in the film Kahona Pyar Hai in 2000. In 2010, the viewers expected good performance from Rajesh Roshan as well for the film Kites. It had been produced by Rakesh Roshan with Hrithik Roshan playing the lead role. Always when the dream combination had worked together they had created magic. Although the music was appreciated the film could not do good business due to use of Spanish which was not understandable to the common masses. In 2013, the viewers were anxiously waiting for the combination of Rajesh Roshan, Rakesh Roshan and Hrithik Roshan to fire in the film Krissh 3. The first part was super hit. Considering the second part that was Koi Mil Gaya, the third part had huge expectations. The film did business of more than 200 crores. Rajesh Roshan’s music also did magic with the hit song “raghupati raghava raja ram”.